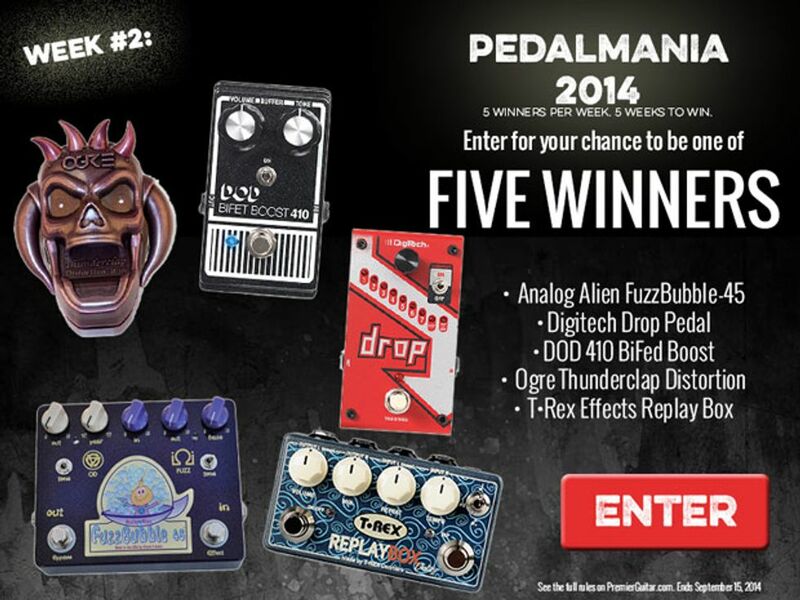 Enter for your chance to be one of 5 winners during week 2 of Pedalmania! Giveaway ends September 15, 2014. Entries will be accepted from anywhere in the world where permitted by law. One winner will be drawn. Since it's introduction in 2010, the FuzzBubble-45 has found a home on hundreds of pedal boards world wide! This unique and versatile pedal offers a plethora of tonal options that allow you to dial in various degrees of overdrive and fuzz independently of each other, with speed and accuracy. Even though the two circuits are design differently, both can be made to sound very similar to each other. It is this design feature that makes the FB-45 so versatile. You can go from a clean boost to a full overdrive or from power chord crunch to a sonic wall of fuzz simply by turning a few knobs and stepping on a foot switch. Like all Analog Alien pedals, the FB-45 sounds very natural and will never cover up your guitars character or your individual playing style. The FuzzBubble-45 can be powered using a 9v+ battery or external power supply and ships in a custom tin retro tin lunchbox with a bottle of Analog Alien bubbles and custom Analog Alien guitar picks! Polyphonic drop tune pedal. Drop from 1 semitone to a full octave. Momentary/latching switch. Effect selector knob. True bypass. 9VDC power supply included. BiFet Boost pedal with selectable Buffer on/off toggle switch. Up to 20dB clean boost. Volume and Tone controls. True bypass. 9V DC power supply input. • EQ ­ Free tone control is possible with two ­point tone control of bass and treble. • Effect on : Press the pedal switch to turn on the effect(the LED indicator lights up). This very studio-like sounding delay features true stereo ins and outs and a generous 3-second maximum delay time. Replay Box doesn't distort or warble - it offers crystal clear, studio-sounding delay, and your dry signal stays fully analog. The pedal features the convenience of Tap Tempo as well as a Subdivision switch which allows you to opt for quarter notes, triplets, or dotted eighths.